Fractionated radio frequency is the most advanced medical technology providing anti-aging improvement on skin tone and texture through ablation and skin resurfacing. The Fractora treatment tip delivers RF energy into the skin through an array of pins producing localized heat and small micro lesion dots in the treatment area, this action allows the skin to heal faster than the entire area was ablated. 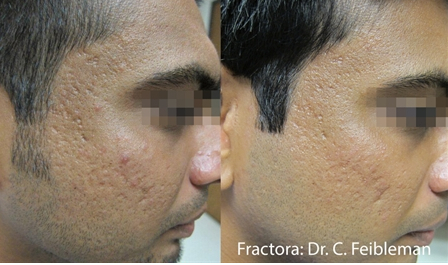 Deep or fine wrinkles, scars, blood vessels, discolored red and brown skin tone can all be effectively treated by Fractora. While some patients can see very significant results after just one treatment, most patients will require 3 to 5 treatments to achieve maximum improvement. Treatment interval should be 4 to 6 weeks apart. Social downtime: treated area may have pinpointed bleeding, red and slight swelling for 1 to 3 days.